Our receptionist will call you to schedule your appointment. Our St James physiotherapy clinic, formerly known as Assiniboine Physio & Sports Multi-Centre, has been serving the St. James and Westwood areas of Winnipeg for the past 20 years. Located at suite 7, 2727 Portage Ave, Winnipeg (at the Courts of St. James), the clinic provides physiotherapy, athletic therapy, massage therapy, and registered dietitian services to a wide range of individuals; from professional athletes, to recreational players, to patients with injuries covered by WCB and MPI. After a thorough physiotherapy assessment, we will provide you with an individualized treatment program to optimize your recovery. Our physiotherapists will work with you in not only how to recover from your current injury, but also in how to prevent injuries in the future. Like acupuncture, we use massage therapy to complement your treatment plan. Massage therapy can be used in the treatment of both acute and chronic conditions, and benefits people of all ages. Core Stabilization Programs aim to improve stabilization and support for the spine. This is achieved by re-training specific trunk muscles, which may be under-used. Our expert assesses dietary habits then educates and counsels clients to implement functional nutritional plans to assist with weight loss, heart health, diabetes and celiac disease, and more. 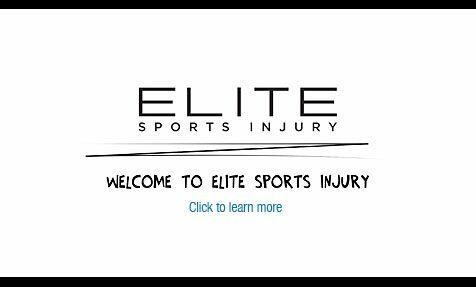 Elite Sports Injury physiotherapy clinics work as a team with the physicians at Legacy Sports Medicine, orthotics experts at Performance Healthware, and the specialized fitness trainers at Elite Performance to bring you the most effective rehabilitation, strength and training programs in Winnipeg. Call (204) 926-2217 to book an appointment today at Elite’s St James physiotherapy clinic! Morning and Evening appointments available | Direct billing to Blue Cross | Free parking.